Stevie, a biographical play about the poet Stevie Smith, was produced for Chichester Festival 2014. The production was sponsored by the University of Chichester and performed from 24 April to 24 May 2014 at the Minerva Theatre, Chichester. This production is a revival of Hugh Whitemore's 1977 play, Stevie, which explores the life of the highly individual English poet and novelist, Stevie Smith. It was chosen to open the prestigious Chichester Festival 2014, as part of a 'landmark season' of plays and other events. 'Nervous and droll, Stevie Smith spends her days as a private secretary at the Newnes Publishing Company and her evenings in the London suburbs eating Battenberg cake and Ginger Nuts with her beloved Aunt. All the time she is writing the piercing poetry and prose that will make her famous. As the Festival team commented in an email newsletter, 'We couldn't have had a better start to the season than with the four star production Stevie'. Rehearsals for Stevie began on 17 March 2014. Around that time, Zoë emphasised how pleased she is that 'this brilliant play' is being revived. She notes that the last major stage production of Stevie was in 1977 (followed by a 1978 film version), with Glenda Jackson in the title role. Stevie marks the second time that Zoe has taken part in Chichester Festival. For her first appearance at the Festival, in 1997, she played the title role in Frank McGuinness' version of Sophocles' Greek tragedy Electra, in a production that subsequently played to audiences in London and on Broadway. Chichester Festival Theatre's heritage arts project, Pass It On, has tweeted a photo from its archive of Zoë as Electra, on-stage at the Minerva Theatre, the venue at which Stevie was also performed. A couple of talks took place after selected performances of Stevie, as outlined below, that are likely to be of particular interest to Zoë's fans. - 'Post-Show Late with Kate: Zoë Wanamaker' (6 May): Zoë chatted to author Kate Mosse about the production and her performance in it. A write-up of this event is available here, and you can listen to the discussion, courtesy of Chichester Festival's YouTube channel, below. - 'Post-show talk: Stevie' (19 May): cast and crew members discussed the production. - The Stevie Project (22 April - 17 May): A weekly theatre project, focused on the poetry of Stevie Smith and led by drama practitioner Kim Hope, which culminated in the following event. - The Poetry of Stevie Smith (17 May): Stevie Smith's poems were introduced by Dr William May, author of Stevie Smith and Authorship, and performed by community actors. Zoë's return to the stage for Stevie is the focus of BroadwayWorld's article about Chichester Festival 2014. In an interview published by the Chichester Observer, Zoe discusses the challenges and rewards of working on the play. Zoë's co-star, Lynda Baron, who portays Stevie Smith's beloved aunt, spoke enthusiastically about the play when interviewed by Portsmouth News. She remarked that Stevie 'really is a marvellous play' and 'such fun'. Stevie opened on 2 May to stunning reviews. Below are some of the highlights. 'Wanamaker turns the poet into a loveable heroine below a mop of stick straight hair and a dress sense that seldom strayed from tweed skirts and sandals. 'It was a perfect piece of casting. Quite apart form the challenge of delivering dialogue which has been curated from the author's poems and novels, this single-set production in the sitting room of Stevie's middle class home in Palmers Green, London, demands a piquancy from its leading lady to lift it from the humdrum to the sublime. 'Zoë Wanamaker gives an increasingly-winning performance as the poet nervously flutters around the house she shares with her "lion" aunt, seamlessly slipping into verse which has now sadly lapsed into obscurity. 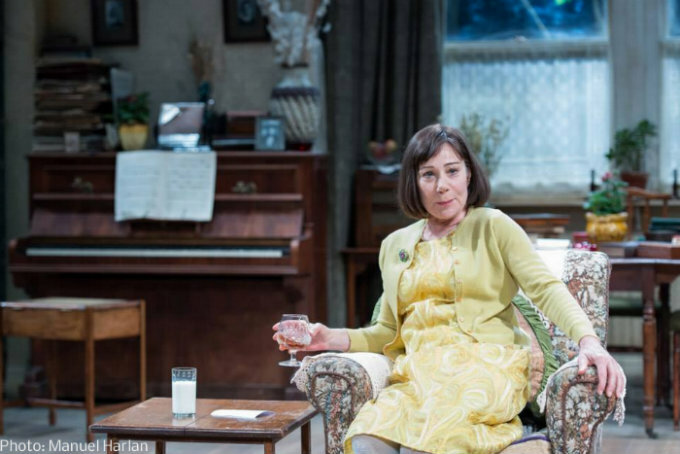 '[T]he evening belongs to Zoe Wanamaker as shambling, rambling, ciggy-puffing Stevie. 'Wanamaker's smoky voiced Smith is cantankerous, independent, depressive, suicidal, lonely and, scarred by her father's desertion, unable to commit to a man.